Admino is a stunning and clear theme filled with all of the utilities your web application may want. Admino is designed for the actual world. Full documentation is included, making it a snap to integrate, tweak to your wants and hit the ground running. Nice typography (served from Google Fonts). Additional documentation (for graphs, styling, and so forth) included. 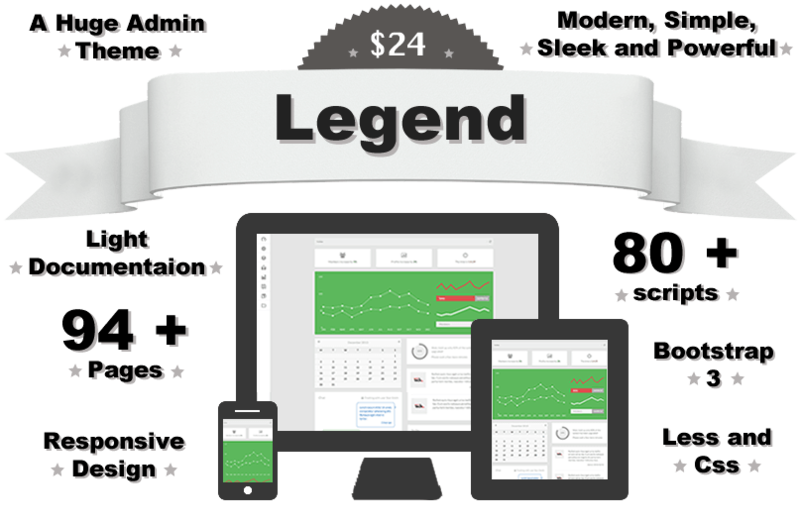 Announcing our huge admin theme – Legend! The pantheon of all time great themes! Sleek, simple, modern design, yet packed to the brim with extras ~ in fact much more than you can possibly need! Legend will show your business off to its full potential. Fully responsive, clean bootstrap template for creative businesses! Take your business to the next level ~ Present it using the Legend template!